If you have a spare moment this afternoon, why not get some background history on the events of Siege at Jadotville? Declan Power’s captivating account of Irish soldiers’ bravery in Katanga, the Congo, in 1961 has brought long-awaited honour to the veterans who were originally sent out on a UN peacekeeping expedition and returned to Ireland to be ignored and dismissed. The Irish heroes were recently honoured with a Unit Citation and are finally celebrated for the immense bravery they showed 55 years ago. 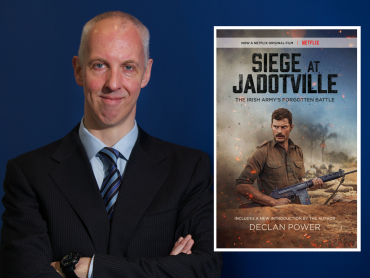 The film adaptation of Siege at Jadotville will premiere tonight in The Savoy, Dublin and is set for cinema release from tonight and on Netflix from October 7th. Coverage on RTE radio has only increased excitement surrounding the release. This short feature aired this morning on Good Morning Ireland includes Tom Gunne’s captivating account of his memory of the combat. A story rife with tension and the messy confusion that accompanies involvement in armed conflict, it isn’t one to miss. Last Friday’s feature with Sean O’Rourke includes a fascinating discussion between O’Rourke, Tom Quinlan’s grandson, Conor, and Declan Power himself. The conversation focuses on an area of Irish military history hardly explored before recent times. Especially interesting, Power explains how Irish politics in the 1960s resulted in a less than lukewarm welcome home for the traumatised soldiers, who were ignored by the government as well as their superiors in the military. This thought-provoking topic draws attention to veteran life in Ireland, which isn’t typically regarded as having a history of overseas military conflict.